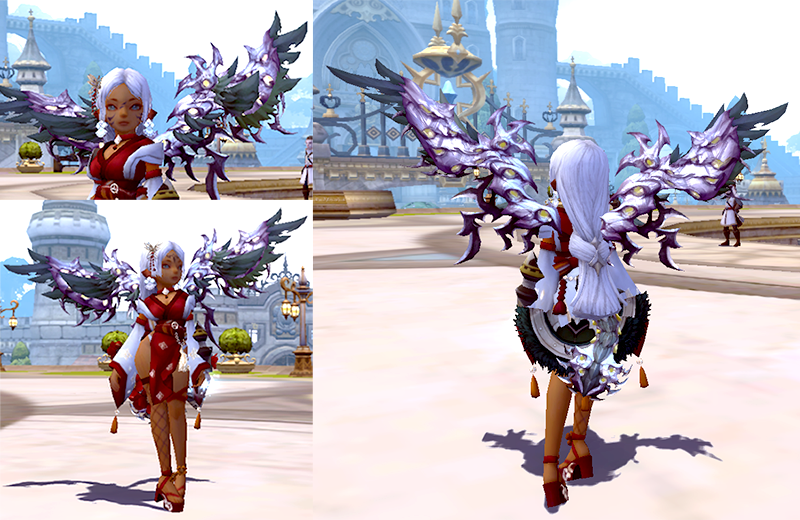 Heroes who clear Forest Dragon Nest during the event period will be given special Forest Draon Wings/Tail/Decal! The rewards will be given on account basis. Green Dragon will be nerfed for a week, so clear Green Dragon Nest easier! Monsters in Green Dragon Nest TimeAttack will be debuffed by 30% lower attack power and HP. Enjoy the all day EXP boosting! 1) During November 8th update ~ November 10th 23:59 PST, Lv.1~94 Lancea class characters will be 400% EXP boosted. 3) If you success to awaken the Lancea characters during November 8th ~ November 21st 23:59, the characters will be given Awakeneing Costume. - Regarding 2), the rewards will be given on character basis. - Regarding 3), the rewards will be given on character basis. - During the event period (Nov. 8th ~ 10th), in total 3 potions will be sent for one Lancea character. Collect the crystals during the event period together, and get plentiful rewards! 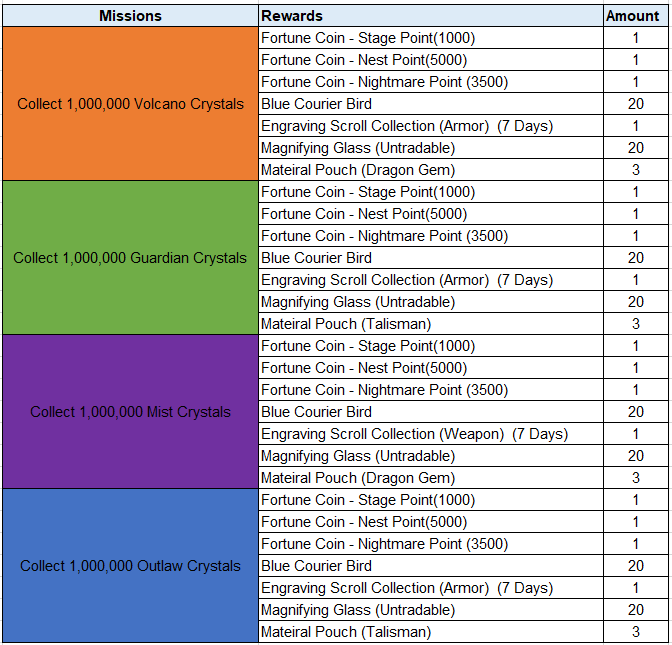 - The whole amount of collected crystals accumulated in the server (all characters) will be counted for the rewards. - The rewards will be given to Special Storage. - The rewards will only be credited to paticipants. *Note: The gestures are NOT purchasable with DNP. * Note: November 8th, after the scheduled update patch, a coupon which enable to purchase the item will be sent to your special storage. The coupon expires after a week. Don't miss the chance to grow your ally! *Note: The package is NOT purchasable with DNP. * Note: Apocrypha characters cannot use Class Change item. Please beware before purchase. * November Promotion * - UPDATED ! During the event period, heros who spent EC/ET more than stipulated tiers below will get the awesome rewards! - Rewards will be collectable for 7 days from Special Storage and rewards that are not collected and have expired will note be reimbursed. Web Cash Shop will be renewaled on November 19th. For celebrating Black Friday, very special deals is for you! Don't miss the chance to be stronger! 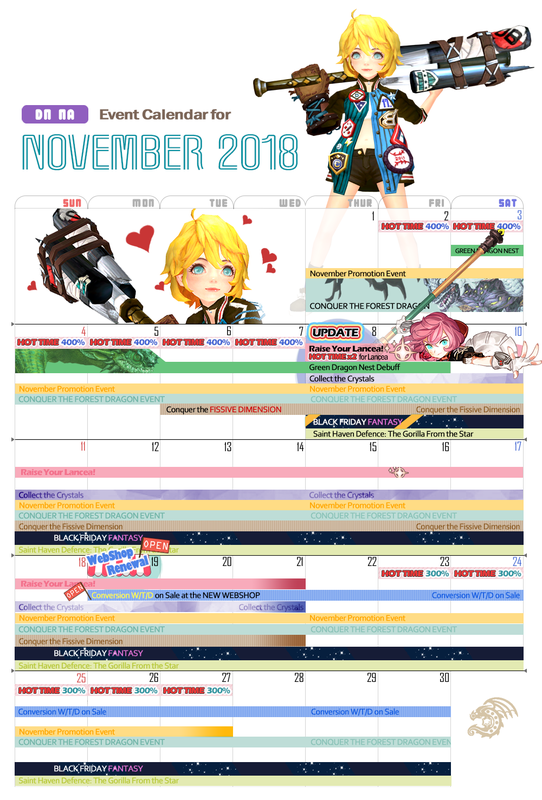 November 19th 00:00 00:30 ~ November 30th 23:59 PST - UPDATED ! - The items can only be purchased during the sales period. - The items can only be purchased from Web Cash Shop at Dragon Nest NA official website. - The puchased items will be sent to the Special Storage of the customer's account.